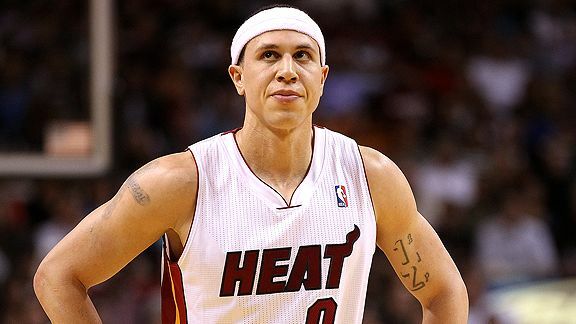 The Heat were known as a top defensive team -- that is, until Mike Bibby arrived. When point guard Mike Bibby has been on the floor for the Heat, Miami's defense has surrendered 15 points per 100 possessions more than when he has sat on the bench. (We use per 100 possessions as the standard to control for potential tempo effects). That sounds bad, but how damaging is that? Consider this: the difference between the league's top defense (Chicago) and the league's worst defense (Cleveland) is 12.5 points per 100 possessions. Do the math, and you find that Bibby's defensive impact has been about three points wider than that. When Bibby takes the floor, can Erik Spoelstra say with a straight face that the team's identity begins and ends with defense? The answer so far has been a resounding "no." If you've paid close attention lately, you've noticed Spoelstra openly searching for answers. Following the Heat's embarrassing loss against the Cavaliers on Wednesday when the Heat allowed the league's worst offense to drop 102 points on them, Spoelstra admitted to the media, "We're a little confused what our identity is." From day one, Spoelstra has emphasized that the Heat's identity needs to come on the defensive end. For all the fireworks on offense, the Heat won't reach their goals without suffocating their opponents on the other side of the floor. That's where championship teams distinguish themselves from the rest of the playoff field. And the Heat bought into Spoelstra's program. But Bibby's presence has made it difficult to apply. Bibby can have that effect. The logic behind signing the veteran after he was bought out after a short stint with the Washington Wizards was just as long as his offensive benefit outweighs the losses on the defensive end, he would be worth it. And he certainly has delivered on the offensive side of the ledger. He has nailed 49 percent of his 3-pointers and kept his turnovers in check, a welcoming sight for those who have watched Mario Chalmers as the Heat's floor general. But on defense? That's where things get ugly. For much of the season, the Heat battled the Bulls and the Celtics for the league's best defense. Now, the Heat have slid in the ranks down to fifth place, separating themselves from the cream of the crop. What's most interesting is when that slide started: when Bibby came into town. He made his debut Mar. 13 against the Magic when the Heat allowed 99 points on just 89 possessions, translating to a defensive efficiency far above the Heat norm. The next game? The San Antonio Spurs dropped 125 points on the Heat. So here are the numbers with Bibby in tow. Since that Orlando game (Bibby's debut), the Heat's defensive efficiency (points allowed per 100 possessions) has ranked 20th in the league at 106.4, according to data from NBA StatsCube. That's worse than Cleveland, Minnesota and Sacramento over that stretch. Before that game, the Heat's defensive efficiency stood at 99.7, one of the very best in the league. But when we key in on Bibby and isolate his time on court, the Heat's defensive numbers go from bad to worse. With Bibby on the floor, the Heat's defense has hemorrhaged 114.5 points per 100 possessions to the opposing teams. With Bibby sitting on the bench? 99.1 points per 100 possessions, or almost exactly where the Heat were before Bibby came into the picture. That's the 15-point difference I was talking about. Now, it's important to note that Bibby's arrival coincided with the Heat's toughest stretch of the season when the Heat faced Orlando, San Antonio (twice), Chicago, Oklahoma City and the Lakers. But even if we ignore those games, the Heat's defense has been abysmal. I mean, the Heat allowed the Washington Wizards to score 107 points on Wednesday without John Wall (mostly), Rashard Lewis, Josh Howard, and Nick Young. That's egregious. Then there's the Cleveland game and the one where they edged Houston despite surrendering 119 points. The Houston's offense is good, but the Heat made them look all-time good. So here's the question: Why is this happening? Bibby's matador act on the defensive end of the floor forces Spoelstra to hide him on the floor. That means that Dwyane Wade or LeBron James often have to cover the opposing point guard, which, in turn, puts Bibby on a taller opponent. A switch like that can have a disorienting effect on the team that has been normally lock-tight with rotations. Making things worse is that Bibby has been dreadful at closing out on shooters. He tends to over-help on other players, leaving his man wide open to knock down a perimeter shot. In fact, according to Synergy Sports, opponents have shot 51.2 percent on spot-ups when guarded by Bibby, but it's effectively 66.3 percent shooting once you account for the fact that many of those spot-up shots come from beyond the arc. You don't need a leaderboard to gauge how atrocious that is. As bad as Bibby's defense has been, the Heat are still outscoring opponents when he's on the floor, if barely. The offense has been top-notch, scoring 114.8 points per 100 possessions, which is three points more efficient than when he rides the pine. So while there's a noticeable benefit to having him on the floor, the Heat are essentially breaking even once we incorporate his defensive liabilities. Breaking even isn't championship material. The Heat don't have any quick solutions at the moment. Chalmers, who is far more active and experienced with Spoelstra's schemes, is still recovering from a knee injury and will be shelved for at least another week. Aside from Chalmers, the Heat have Eddie House who is a one-way player. Furthermore, Mike Miller, a player that Spoelstra likes to play in place of a traditional point guard, is on the shelf as well with a sprained knee. As a new arrival, Bibby may have some catching up to do with the Heat defensive schemes. With the playoffs on the horizon, the Heat have no choice but fast track that process. But even if Bibby gets up to speed, the Heat will have to continue compensating for his blemishes. Considering his history, there's little hope that the data during Bibby's 383 minutes in a Heat uniform can be written off as a statistical aberration. There's still time for the Heat to reclaim their identity as a defensively-focused squad. But as we've seen over the past month, Bibby is making it hard for the Heat to look in the mirror and like what they see.